If decorating Easter Eggs doesn’t offer quite enough opportunity for hands-on crafting this year, there are plenty of other options to make creative and cute things in the kitchen. You can make Peeps cupcakes, for instance, or you can pick up a set of 3D Bunny Cookie Cutters and make some awfully cute cookies. The cookie cutters, which come in a set of four and are made of heavy-gauge stainless steel, make cut-outs for bodies, front and back legs, and ears. The set also comes with a sugar cookie recipe that doesn’t spread out during baking, which allows the cookie pieces to fit together cleanly, and a recipe for royal icing, which is used to glue the ears in place. They’re certainly not as simple as some springtime cookie-making options, but the results are great. Making this type of cookie and decorating it is a great project for kids and their friends, too. What will they think of next! Very cute. 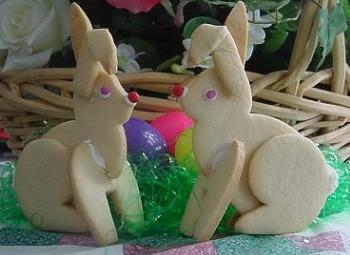 Those cookies are adorable! I love making 3D cookies… they always look so impressive but are really quite easy to make! The idea of 3D cookies has never occurred to me before — very intriguing! My neighbors kids loved this idea!